Sydney Long was born at Goulburn, NSW and studied under A J Daplyn, Frank Mahoney and Julian Ashton at Art Society of NSW classes 1892-96. He was taught etching in London by Frank Emanuel and Malcolm Osborne and started to etch in earnest in 1918-19, devoting much of his time to it for the following twelve years. Sales of his etchings were his livelihood and helped establish his reputation in London. He was an Associate of the Royal Society of Painter-Etchers and Honorary Secretary of the Society of Graphic Arts in London. Following his return to Australia in 1925, Long was elected President of the Australian Painter-Etchers Society. 'I am going to take up etching, have been intending to do so for some time, so I will be able to supply you with a bigger variety of subjects later. When I was in Cornwall I showed photographs of my work to Alfred Hartley who is one of the finest etchers in England. He advised me strongly to take up etching as my work would etch admirably, there being a decorative feeling for line in it. I was very interested in your account of the Lindsay etching from one of my landscapes and would very much like to see what he made of it but he hasn't sent the copy as you said he was going to'. 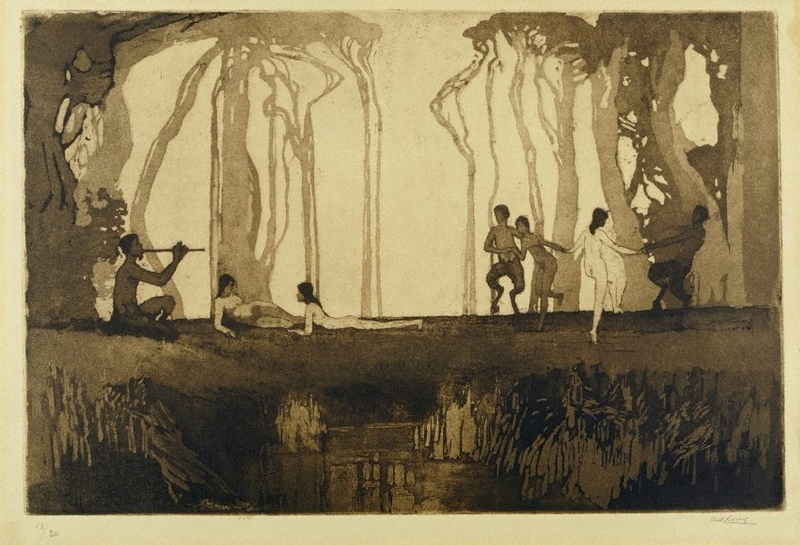 Later (undated), 'I am going strong at etching and have already done several plates, so will pack you out some proofs. If there's any particular picture of mine you would like done, let me know. I have good reproductions of 'The spirit of the plains', 'Pan' and all the other Gallery pictures and intend to produce fair sized plates later of them in soft-ground and aquatint. In the meantime I am doing some stylish things of landscapes etc, of course I won't be able to send many until I get a printing press of my own but I will be able to send you proofs very shortly and perhaps you could book orders for them'. Signed l.r., pencil "Sid Long". Not dated. Deborah Edwards, Stampede of the Lower Gods: Classical Mythology in Australian Art , 'The Antipodean Arcady / 'When Pan purloined Apollo's lyre'', pg. 8-31, Sydney, Sep 1989, 11, 21 (colour illus. ), 23, 24, 63. Sarah Engledow', The world of Thea Proctor , 'The world of Thea Proctor', pg. 16-84, Canberra, 2005, 22. Denise Mimmocchi, Australian Symbolism: the art of dreams , ‘Sydney Long: Arcadian myth and the decorative landscape’, pg. 110-123, Sydney, 2012, 111,114-115 (colour illus. ), 146, 153 (colour illus.). image on pg.153 is a detail.